East Asian age reckoning originated in China and continues in limited use there and in Japan, but is still common in Korea. People are born at the age of one, i.e. the first year of lifetime using ordinal number (instead of "zero" using cardinal number), and on Chinese New Year or New Year's Day one year is added to their age. Since age is incremented at the beginning of the lunar or solar year, rather than on the anniversary of a birthday, people may be one or two years older in Asian reckoning than in the international age system. Under the traditional reckoning in China, age changes on the first day of Chinese New Year. In Japan and South Korea, New Year's Day is used as the date of change of age for the traditional system. Of the three, only 周歲/周岁 (Chinese), zhōusuì (pinyin) = "round age" may be used as a count word. When a child has survived one month of life (29 days if lunar month reckoning) a mun yuet (Chinese: 滿月; pinyin: mǎnyuè) celebration can be observed, in which duck or chicken eggs dyed red are distributed to guests to signify fertility. The traditional Japanese system of age reckoning, or kazoedoshi (数え年, lit. "counted years"), which incremented one's age on New Year's Day, was rendered obsolete by law in 1902 when Japan officially adopted the modern age system, known in Japanese as man nenrei (満年齢). However, the traditional system was still commonly used, so in 1950 another law was established to encourage people to use the modern age system. Japanese uses the word sai (歳 or 才) as a counter word for both the traditional and modern age system. Koreans who use the traditional system refer to their age in units called sal (살), using Korean numerals in ordinal form. Thus, a person is one sal ("han sal", 한살) during the first calendar year of life, and ten sal during the tenth calendar year. In modern South Korea the traditional system is used alongside the international age system which is referred to as "man-nai" (만나이) in which "man" (만) means "full" or "actual", and "nai" (나이) meaning "age". For example, man yeol sal means "full ten years", or "ten years old" in English. The Korean word dol means "years elapsed", identical to the English "years old", but is only used to refer to the first few birthdays. 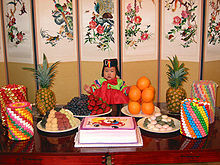 Cheotdol or simply dol refers to the first Western-equivalent birthday, dudol refers to the second, and so on. The traditional system has not been used in modern North Korea since the 1980s. The Korean Birthday Celebrations by the lunar calendar is called eumnyeok saeng-il (음력 생일, 陰曆生日) and yangnyeok saeng-il (양력 생일, 陽曆生日) is the birthday by Gregorian calendar. For official government uses, documents, and legal procedures, the international system is used. Regulations regarding age limits on beginning school, as well as the age of consent, are all based on this system (man-nai). The age limit for tobacco, alcohol use are after January 1 of the year one's age turns to 19. In Eastern Mongolia, age is traditionally determined based on the number of full moons since conception for girls, and the number of new moons since birth for boys. ^ Shi Liwei (30 April 2009). "Why Chinese People Have a Nominal Age". ChinaCulture.org. Archived from the original on 5 October 2009. Retrieved 11 November 2009. ^ "98, 90 or 93? Expert sheds light on tycoon's age". The Star. October 25, 2007. Archived from the original on June 4, 2011. Retrieved 2009-02-26. ^ "中国人为何还有一个虚岁". Retrieved 24 January 2012. ^ レファレンス事例詳細: 相-090002, Collaborative Reference Database. (Accessed 2009-11-11.) "なお、年齢が数えか満年齢かについては、現行法規である「年齢計算ニ関スル法律」が明治35年12月2日法律第50号として存在するが、その前に「明治六年第三十六号布告」で満年齢について規定された。 (translation: Regarding whether one counts age by ``kazoedoshi`` or the modern age system (満年齢), there exists the current "Legal age calculation" law in the form of Meiji 35 (1902), December 2, Act no. 50, but prior to that the use of the modern age system was set forth in the "Meiji 13 Proclamation No. 6".)" ^ "年齢計算ニ関スル法律 Act on Calculation of Ages" (in Japanese). Ministry of Internal Affairs and Communications Japan. 1902. ^ "Act on Calculation of Ages". Ministry of Justice, Japan. 1902. ^ Hirofumi Hirano, July Heisei 40, 年齢の計算に関する質問主意書 (Memorandum on questions about the calculation of age) Archived 2009-06-28 at the Wayback Machine, Japan House of Representatives. (Retrieved 2009-11-11) "わが国では、「年齢のとなえ方に関する法律」に基づき、昭和二十五年以降数え年による年齢計算を止め、満年齢によって年齢を計算している。 (translation: In Japan, the age laws which were originally based on the calculation by East Asian age reckoning (数え年) were replaced in Showa 25 with the modern age system (満年齢) of age calculation.)" ^ "年齢のとなえ方に関する法律Act on Designation of Ages" (in Japanese). Ministry of Internal Affairs and Communications Japan. 1950. ^ "Act on Counting of Ages". Ministry of Justice, Japan. 1949. ^ Song, Jae Jung. (2005), pp. 81–82, (quote) "Koreans prefer native Korean to Sino-Korean numerals when telling their own or other people's age,...Note that the native age classifier sal must be used with native Korean numerals and the Sino-Korean age classifier sey with Sino-Korean numerals,.."
^ "In Korea, all children are older than their European peers". Pravda. July 16, 2013. Retrieved 2014-04-08. ^ a b Park, Hyunjoo; Pan, Yuling (2007-05-19). "Cognitive Interviewing with Asian Populations: Findings from Chinese and Korean Interviews" (PDF). Anaheim, CA: RTI International. Retrieved 2009-11-11. Koreans are considered one year old at birth and added another year at New Year’s....some Koreans may use American age counting convention while others still follow Korean convention. To eliminate this confusion, Korean asked “만나이(Man-nai)’: the same as the U.S. age counting convention. ^ 만7(滿) (in Korean). Nate Korean Dictionary. Archived from the original on 2013-01-25. Retrieved 2009-11-11. 시기나 햇수를 꽉 차게 헤아림을 이르는 말.(trans. The word refers to calculating full years or periods. ^ a b Hilts and Kim, (2002), p. 228 (quote) "Koreans have a peculiar way of calculating age. When you're born, you're already one year old, and then you get another year older when New Year's Day rolls around. The result is that your hangungnai (한국나이), 'Korean age', is usually one to two years older than your man-nai (만 나이), 'actual age'. Under-age kids sometimes try to take some advantage of this, but eligibility for drinking, obtaining license etc is determined by your actual age." ^ 돌1 [Dol] (in Korean). Nate Korean Dictionary. Archived from the original on 2011-07-14. Retrieved 2009-11-11. Ⅰ. (명사) 어린아이가 태어난 날로부터 한 해가 되는 날. (Ⅱ ) 1. 생일이 돌아온 횟수를 세는 단위. 주로 두세 살의 어린아이에게 쓴다. 2. 특정한 날이 해마다 돌아올 때, 그 횟수를 세는 단위. ^ "성년 成年, full age" (in Korean). Nate / Britannica. Archived from the original on 2011-06-10. Retrieved 2009-11-11. 한국의 경우 만 20세로 성년이 되며(민법 제4조)...연령의 계산은 민법 제155조 이하의 규정에 의하나, 출생일을 산입한다(동법 제158조). 1977년의 민법 개정으로 혼인에 의한 성년의제(成年擬制)의 제도를 도입했다..대통령선거법·국회의원선거법·국민투표법·지방자치법·지방의회의원선거법·미성년자보호법 등에서는 이 원칙이 적용되지 않는다. ^ "청소년보호법" [Adolescent Protection Law]. 국가법령정보센터 (in Korean). 대한민국 법제처. 7 July 2016. Retrieved 30 July 2016. "청소년" 이란 만 19세 미만인 사람을 말한다. 다만, 만 19세가 되는 해의 1월 1일을 맞이한 사람은 제외한다. DuBois, Jill (2004). Korea. 7 of Cultures of the world. Marshall Cavendish. pp. 72–73. ISBN 0-7614-1786-9. Hilts, J. D.; Kim, Minkyoung (2002). Korean phrasebook. Lonely Planet. p. 228. ISBN 1-74059-166-6. Song, Jae Jung (2005). The Korean language: structure, use and context. Routledge. pp. 81–82. ISBN 0-415-32802-0.